It’s not very often that most of us hear success stories from Aboriginal communities. The overwhelming majority of the mainstream media treatment of Indigenous issues focuses on the (very real) problems which affect Aboriginal people, problems which can seem so complex and entrenched that imagining solutions usually seems impossible. In a society still dominated by a collective denial of our violent past and oppressive present, a society which hides behind empty sloganeering about ‘progress’ as it continues to punish Aboriginal people whenever they articulate their desire for control over their own lives, any coverage at all can seem like a blessing. But I wonder if only ever hearing the negative stories helps to reinforce an understanding of the situation as intractable and hopeless—if it perhaps leads us away from imagining and articulating alternatives. A couple of weeks ago, my partner and I were privileged to be able to visit Winda-Mara, an Aboriginal co-operative run by local Gunditjmara people in Heywood, south-western Victoria. Winda-Mara was established in 1991 as an Aboriginal health organisation with the aim of providing culturally appropriate healthcare to the community. Since then, the organisation has expanded to also include housing, education, employment, and environmental and cultural heritage management. Winda-Mara owns and manages a number of properties around Budj Bim, an extinct volcano known to whitefellas as Mt Eccles. These properties have extraordinary environmental and cultural significance—they contain a number of ancient dams, eel traps and houses built from the volcanic rock, which have been dated to be at least 8,000 years old. Many archaeologists consider these structures to be the oldest evidence of aquaculture in the world, and the sites have been recognised as significant on both a national and international scale. Before colonisation, they were part of a network of villages which were home to an eel industry whose products were traded over the whole of south-eastern Australia. 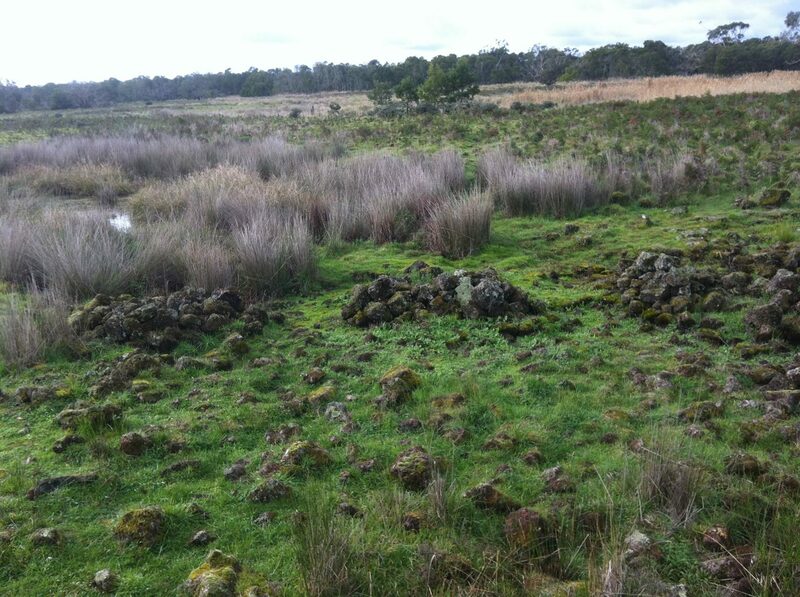 Remains of 8000 year old eel traps at Kurtonitj Indigenous Protected Area in western Victoria. The Budj Bim cultural landscape fundamentally challenges one of the central assumptions of settler society about Aboriginal people—the idea that pre-1788, Aboriginal societies were shiftless hunter-gatherers who roamed the landscape in their hand-to-mouth struggle to find food. Sites like Budj Bim confirm a strikingly different reality—one in which Aboriginal communities owned and managed their lands, modifying the landscape to ensure that food sources were reliable and abundant. The fact that they were able to achieve this without the widespread ecological destruction which has characterised the management of the continent by Europeans belies colonial conceits of racially-determined intellectual superiority. Sites like Budj Bim are a powerful counterargument to the concept of terra nullius—Aboriginal people did indeed own and manage land before whitefellas turned up. Stories like Winda-Mara’s need to be told—they show how Aboriginal communities are more than capable of creating their own forms of livelihood, if given space to do so. Winda-Mara’s diversity has been key to its success—rather than being just a “health” or “employment” program, it approaches issues holistically, asserting that cultural heritage protection and community health are fundamentally linked. Now that my eyes are open to it, I’ve realised that other Aboriginal communities across the country have similar stories. Let’s find and share these stories, and support these communities in articulating their own visions for their futures.